Two main foundations, the Chinati Foundation and the Judd Foundation, preserve Judd’s legacy and the artwork that was created here along with new galleries that are bringing a fresh perspective. The cast concrete blocks run along the border of Chinati in various configurations and form, blending in the landscape and changing with the light throughout the day. Dan Flavin’s neon work spans 6 buildings and is SO cool to experience in real life! Set in a former army hospital, the C-shaped building is lined on all sides with a long sequence of windows that surrounded a central courtyard. 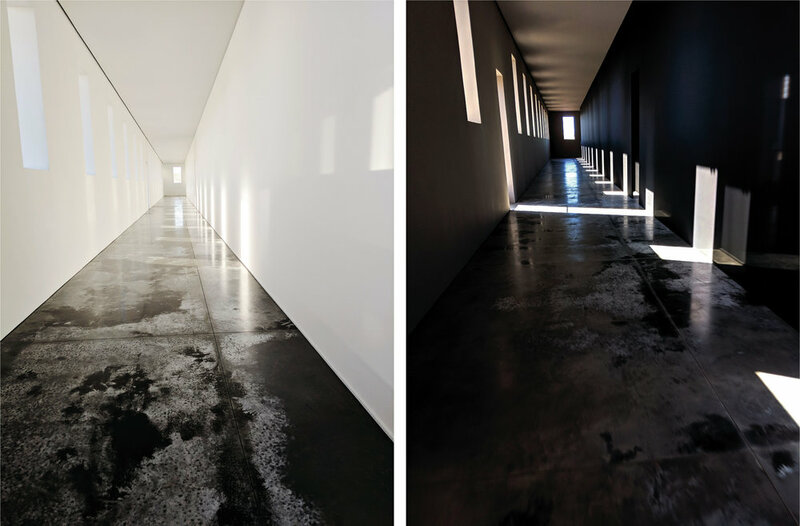 As you move through the work, you progress from a light hallway to a dark hallway with ever changing light and shadows cast from the windows. Founded by artist Meghan Gerety, Pure Joy is a multipurpose space made up of a gallery and a store specializing in books and objects. Neon art by Kendall Weir at Pure Joy. Because Marfa is such a small town most places have limited or weekend only hours. Definitely check if places are open before you head out! Color palette on point at Al Campo. El Cosmico: Ugh. Just the cutest little vintage trailers and safari tents west of the Mississippi! El Cosmico is somewhere between glamping and boutique hotel. The trailers have individual kitchens, bathrooms (with a outdoor showers—but not in a glamorous way) and beds, while the safari tents offer platform beds with electric blankets, and electrical outlets. There are a few outdoor communal bathrooms and showers spread across the grounds and an adorable main lobby with artisanal products and snacks. Hotel St. George: Built on the site of the original Hotel St. George established in 1886, the hotel maintains some of the past and fused with local artistry. The Thunderbird: Though vague in what you can find out about this place online, there is def a bit of an intrigue here with sayings like “We’re open when we’re open” and “Book now or don’t”. Here you will find a no-frills revamped retro vibe and the treat of a wonderful restaurant, The Capri. Airbnb: There are sooooo many cool looking houses in Marfa that I would actually prefer to stay at one (or many!) of these than a hotel! Suite #3 at 105 Lincoln.